Years ago, the Hannigans found and bought the perfect land for their retirement dream-- 3 1/2 acres in one of America’s most scenic spots—Martha’s Vineyard Island off Cape Cod. When they first saw the land, it was a pristine wildflower meadow, and as the years went by, it seemed to be more and more beautiful. Then when the time finally came, and construction began, Karen writes, almost a full acre had to be disturbed for the buildings and a large septic field. She says it made the beautiful land look like “a war zone.” But not to be deterred, she decided to replant wildflowers from American Meadows and chose the species carefully, so they would recreate the natural look she had loved when she first saw the property. And today, just look at the results! 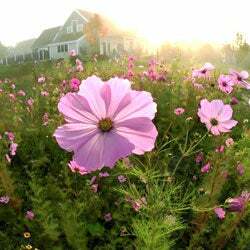 The first fall with Cosmos in bloom. 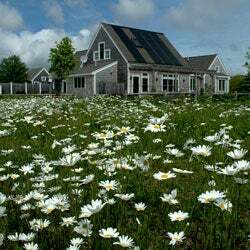 10 years ago we bought a 3 acre meadow on the Island of Martha's Vineyard. It would be a place where we would retire and use as a base when our grown family gathers. Our plan was to build a main house and a guest house and do so in stages. With the natural meadow that we had to work with we were fortunate in that we did not have to clear trees or even plant wildflower seeds. First, we built the guest house. Then came the garage and studio, Finally we added a pool and turned our garage into the main house. At this point, we needed to install a very large septic system and leaching field that would serve all three buildings. Unfortunately, it required digging up our natural meadow. In the end almost an acre of land was disturbed. This is when I got on line and started researching how to replant my meadow. I was ever so fortunate to find American Meadows. 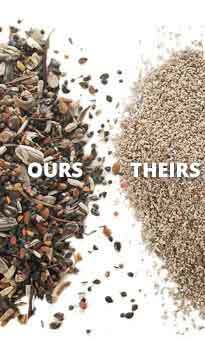 I loved that you could by pure seed and not fillers or grasses that you find so often in the "mixed meadow seed" boxes offered at so many stores. I had tried those before in another area on my property and was very disappointed when huge areas of invasive grasses appeared as part of the mix. My meadow is about 3/4 of a mile from the ocean on the south side of Martha's Vineyard. It is a place that is always windy—the winds off the ocean blow constantly. And we’re also about 10 degrees colder than other places on the Island. Moreover, I tried to stay with wildflowers that are seen naturally across the Island. After the septic was installed and the land graded back to its original contour, I hand seeded, throwing the seed in wide sweeps to make it look natural and not like it “snowed flowers.” I planted pure seed: Lupines, Oxeye daisies, Coreopsis and Black-eyed Susans. I also planted the North American mix because it had some annuals in the mix for my first summer’s color. Needless to say my heart ached when the bulldozers worked their way into my meadow. For months our land looked like a war zone. We had two major buildings, a swimming pool and two driveways being installed. Winter set in early that year and for months we had dirt piles and trenches going in every direction all frozen in place. Finally spring thaw hit and work continued on the land part of our project. When the first seeds started to sprout I was very excited. When the color started, I knew all that work was going to pay off. Now this is the 2nd season and my ground is covered with thousands of tiny plants all waiting for their turn and time to bloom. Thank You, American Meadows, for giving me my meadow back. It was beautiful before but it is magnificent now!